This site is a resource for those who use theatre techniques for other or more than arts or entertainment purposes, and for those whose theatre styles incorporate other than traditional presentation styles. The guide is designed to help those who are exploring some of the niches being filled by theatre practitioners who seek to use their skills in ways not represented on a traditional stage. Because this area is not a defined profession, and because its practitioners are in varied fields, please consider this a site permanently under construction. Theatre professionals throughout the world are working to bring their skills as change agents, as awareness builders, and as empathy masters to the personal and social needs of a world hungry for connection. This website is intended to eliminate the need for a time-, space-, and resource-consuming association. The differing forms of Applied Theatre are varied enough that terminology remains a difficulty. Theatre-in-Education, Drama-in-Education, Non-Scripted Theatre, Sociodrama, Forum Theatre, Practical Theatre are all descriptors which can be found in the various scholarly indices. This forum may provide the means to arrive at more widely accepted terminology for the various branches of this growing field. The APPLIED AND INTERACTIVE THEATRE GUIDE was created in 1995 by Joel Plotkin. Over the short span of years that it has been online, the AITG has received hundreds of thousands of visits from Internet users all over the world. In the Fall of 1997 Joel Plotkin drafted some thoughts about Interactive Theater into an article published here in January 1998, rather than in an academic journal. He has told the AITG, "I'd love to have an on-going dialogue with people about these issues." In September 1998 Joel Plotkin left the United States for a year and passed on the site to Toni Sant, who at that time was a graduate student in Performance Studies at New York University. The guide was redesigned to incorporate a message board, search facilities, and other enhancements. When Toni Sant finished his doctoral studies at NYU, the site was overhauled and expanded in response to the growing demand for an easy solution to keep the guide up to date. The current version of the AITG has been made technically possibly by the MM Solutions team who have provided technical assistance and web hosting for this website, free of charge, since the fall of 2002. In September 2004 Toni Sant moved to the UK to take up a position as Lecturer in Performance and Creative Technologies at the University of Hull's Scarborough Campus. He continues to maintain the website from there. 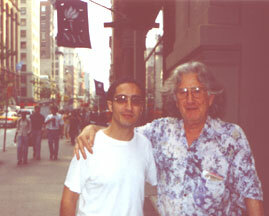 Photo caption: Toni Sant with Augusto Boal at the end of a 3-week intensive workshop on the Theatre of the Oppressed at New York University in 1999.